Have you ever had God lead you to a solution that is so simple you are almost embarrassed it took you years to figure out? That’s the case with this revelation! For years I’ve been battling how to encourage my kids to be creative without having to clean up the ensuing chaos of craft supplies. As a homeschooling mom, this is an issue that keeps coming up over and over as my kids have lots of time for art projects and coloring. Moms of little ones may experience this too, or even moms of older kids during summer breaks. Well, one day as I was cleaning up a messy school room table… again…. I uttered a prayer, not even expecting an answer, “Lord, how do I keep encouraging my kids to be creative and not have the mess? !” and suddenly God downloaded a great solution into my mind! (Some of the items I put in $1 pencil boxes I found, and then placed them in the drawer.) All of a sudden, the supplies looked cute and organized! When I was trying to give them everything, I was really giving them clutter. It was amazing to watch their interest in coloring be renewed. Instead of getting out odds and ends and leaving them on the table, they came, colored, and created… without clutter. They even knew how to clean up after themselves so much better because there were fewer categories of items to clean up! And because I put everything at their level, it was easier to hold them accountable to cleaning up. When it came time to sort the projects into their dividers it was also easier because the pages weren’t 3D! The kids didn’t need to shove odds and ends into their shelf. Such a bonus! So what did I do with the other supplies? 2. Carve out a time for them to be creative with other supplies. I sorted through the other items and kept the coolest things. I put them in a bin on my laundry room shelf and labeled it “Creative Galaxy” (there is a show that has this name and my kids have seen it a few times, but basically it is just a catchy title so we named our time after it). About a week after my kids had their “art supply minimalism makeover”, I got out the bin. I pulled out items and laid them out on the table. “Alright guys, you can use whatever you want! Let’s just be creative!” I put on music and sat down for a half hour with my kids. We each created a project. I wrapped a piece of cardboard in a fun wrapping paper, wrote a Bible verse on it, and added a coffee filter flower. One of my sons made puppets, one a picture of a ninja using ribbons and wrapping paper, and another a 3D fire truck out of a gift bag. -Doing this about every other week seems right for us. You can adjust the frequency to find what works for you. But I’ve found this keeps the supplies fresh and exciting without being overwhelming for me to keep up in our schedule. On the weeks we don’t do this, I usually have a painting time for them. 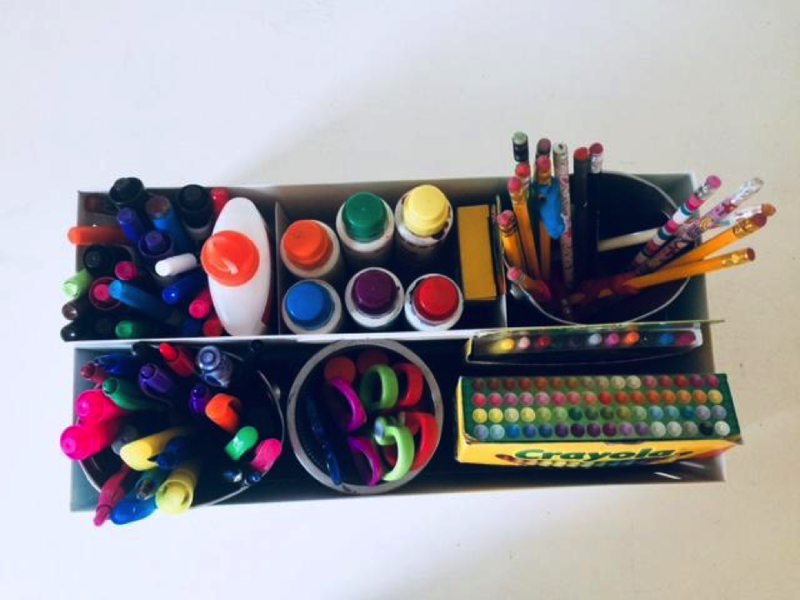 -After a few “Creative Galaxy” Sessions, I noticed that some items in the bin were not being used or even contemplated by my kids, so I recycled or tossed those items. To maintain our new system, I have set a weekly reminder to sort through the art divider with the kids. I needed this reminder to stay on top of the paperwork. It takes 10 minutes, and it is a good training exercise for us all. This is an additional idea that is a huge win for kids with the love language of gifts: “printables”! About once or twice a week, I will sit down at my computer and do an image search with each child. (Understandably for their protection, I definitely do this with them!) For example, Lincoln may have me search for a picture of a baby cheetah. He will find one he likes, and we print it out for him to color. I let each kid pick 3-5 pages (and they need to decide pretty quickly!). It is amazing how much they prefer this over coloring books. For some reason the process of them picking out exactly what they want feels like they are getting a present. It is one of their favorite parts of the week, and it buys me about 30 minutes of peace because they are so excited to color when they have these! Since starting this practice, I have recycled or donated most of our coloring books. Even when the books were of their favorite characters, the kids still didn’t use them very much. Two exceptions are the giant character coloring books,and the large Melissa and Doug themed books. 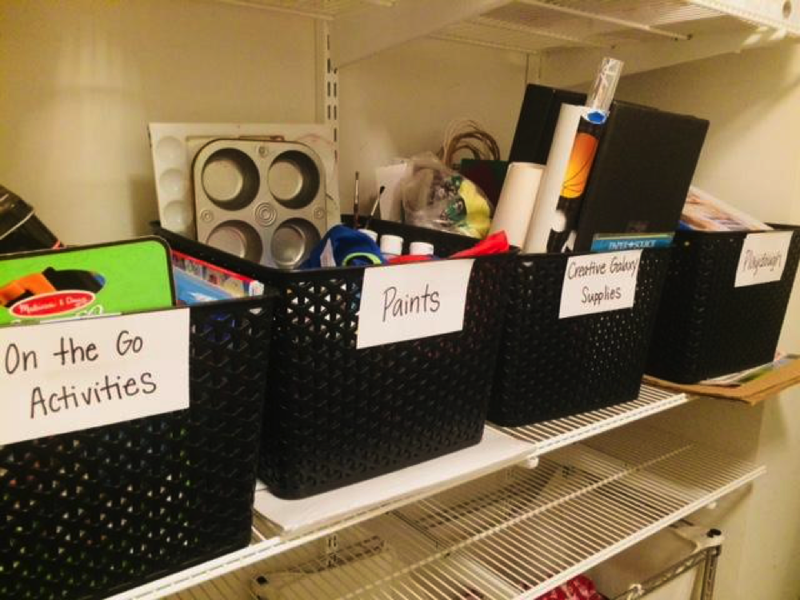 Perhaps your kiddos are similar and you can purge these too! At the end of the day, it really is simple: our God is a God of order and He is creative. We are made in His image, so we should foster each of these traits. For most people, there is probably a bent towards one side or another. I think it’s great to raise our kids in an environment in which each quality is valued. I hope this idea helps you strike some balance! Posted on November 14, 2018 by Stephanie Hickox and filed under Building Your Family and tagged fun with kids.